Unpack the misconceptions that have been spread about the movement by separating fact from fiction about Black Lives Matter. Racism is the belief that one group is inherently superior to another and the institutions that function as such. Black Lives Matter is not saying that all lives don’t matter or that other people’s lives aren’t as valuable as African Americans’ lives. It is arguing that because of systemic racism (dating back to the implementation of the Black Codes during Reconstruction) blacks disproportionately have deadly encounters with cops, and the public needs to care about the lives lost. During an appearance on “The Daily Show,” Black Lives Matter activist DeRay McKesson called the focus on “all lives matter” a distraction technique. He likened it to someone criticizing a breast cancer rally for not focusing on colon cancer as well. Giuliani’s accusation that Black Lives Matter activists sing about killing the police is unfounded. He’s conflated rap groups from decades ago, such as Ice-T’s band Body Count of “Cop Killer” fame, with the black activists of today. Giuliani told CBS that, of course, black lives matter to him, but his remarks suggest he can’t be bothered to tell one group of blacks from another. Whether rappers, gang members or civil rights activists are the topic at hand, they’re all interchangeable because they’re black. This ideology is rooted in racism. While whites get to be individuals, blacks and other people of color are one and the same in a white supremacist framework. The accusation that Black Lives Matter is racist also overlooks the fact that people from a broad coalition of racial groups, including Asian Americans, Latinos and whites, are among its supporters. In addition, the group decries police violence, whether the officers involved are white or people of color. When Baltimore man Freddie Gray died in police custody in 2015, Black Lives Matter demanded justice, even though most of the officers involved were African Americans. Detractors of the Black Lives Matter movement argue that police do not single out African Americans, ignoring mountains of research that indicate racial profiling is a significant concern in communities of color. These critics assert that police have a greater presence in black neighborhoods because black people commit more crimes. On the contrary, police disproportionately target blacks, which doesn’t mean African Americans break the law any more often than whites do. The New York Police Department’s stop-and-frisk program is a case in point. Several civil rights groups filed a lawsuit against the NYPD in 2012, alleging that the program was racially discriminatory. Eighty-seven percent of the individuals NYPD targeted for stops and frisks were young black and Latino men, a greater proportion than they made up of the population. Police even targeted blacks and Latinos for most of the stops in areas where people of color made up 14 percent or less of the population, indicating the authorities weren’t drawn to a particular neighborhood but to residents of a particular skin tone. Ninety percent of people NYPD stopped anywhere did nothing wrong. Although police were more likely to find weapons on whites than they were on people of color, according to the New York Civil Liberties Union, that didn’t result in the authorities stepping up their random searches of whites. Racial disparities in policing can be found on the West Coast as well. In California, blacks comprise 6 percent of the population but 17 percent of people arrested and about a quarter of those who die in police custody, according to the OpenJustice data portal launched by Attorney General Kamala Harris in 2015. 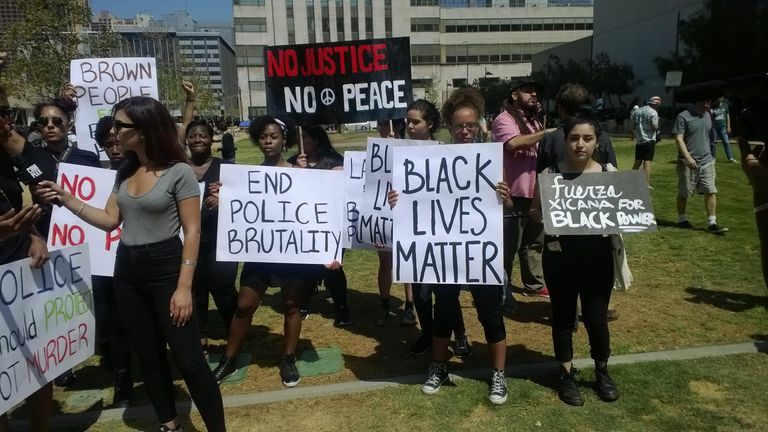 Collectively, the disproportionate amount of blacks stopped, arrested and who die in police custody explains why the Black Lives Matter movement exists and why the focus isn’t on all lives. Conservatives love to argue that African Americans only care when police kill blacks and not when blacks kill each other. For one, the idea of black-on-black crime is a fallacy. Just as blacks are more likely to be killed by fellow blacks, whites are more likely to be killed by other whites. That’s because people tend to be killed by those close to them or who live in their communities. That said, African Americans, particularly pastors, reformed gang members and community activists, have long worked to end gang violence in their communities. The most defamatory and irresponsible critique of Black Lives Matter is that it provoked Dallas shooter Micah Johnson to kill five police officers. He added that law-abiding citizens with big mouths led to the killings. The month before, Patrick summed up the mass murder of 49 people at a gay club in Orlando, Fla., as “reaping what you sow,” revealing himself to be a bigot, so it’s not entirely surprising that he would choose to use the Dallas tragedy to accuse Black Lives Matter as being accomplices of sorts to murder. But Patrick knew nothing about the killer, his mental health or anything else in his history that led him to commit such a heinous crime, and the politician willfully overlooked the fact that the killer acted alone and was not part of Black Lives Matter. Generations of African Americans have been angry about police killings and racism generally in the criminal justice system. Years before Black Lives Matter existed, police had a strained relationship with communities of color. The movement didn’t create this anger nor should it be blamed for the actions of one deeply troubled young man. While police shootings are the focus of Black Lives Matter, deadly force isn’t the only issue adversely affecting African Americans. Racial discrimination infiltrates every facet of American life, including education, employment, housing and medicine in addition to the criminal justice system. While police killings are a grave concern, most blacks won’t die at the hands of a cop, but they may face barriers in a variety of sectors. Whether the topic at hand is the disproportionate amount of black youth suspended from school or black patients of all income levels receiving poorer medical care than their white counterparts, black lives matter in these instances as well. The focus on police killings may lead everyday Americans to think they’re not part of the nation’s race problem. The opposite is true. Police officers don’t exist in a vacuum. The implicit or explicit bias that reveals itself when they deal with black people stems from cultural norms that signal it’s okay to treat blacks as if they’re inferior. Black Lives Matter argues that African Americans are equal to everyone else in this country and institutions that don’t operate as such should be held accountable.